The Galaxy A7 brings you innovation all in a budget price tag. Capture more on its triple camera with ultra-wide lens, and enjoy entertainment on the impressive 6-inch screen with home cinema sound. Featuring a glossy 2.5D finish, the Samsung Galaxy A7 is both stylish and sturdy. Offering smooth rounded edges that make the handset a pleasure to hold, you can enjoy easy access to feature you need regularly, such as the fingerprint scanner which can be conveniently found on the side. Immerse yourself in crystal-clear movies and games, thanks to the 6 inch Super AMOLED Immersive Display to the front of the handset. In addition, you can stay up-to-date on the weather, the time, and incoming notifications without unlocking the phone, with the always-on display feature. 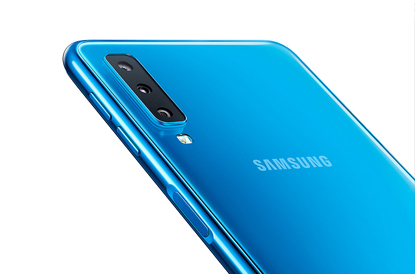 Combining three rear lenses to produce impressive results, the 24MP camera on the Samsung Galaxy A7 boasts high resolution and a small aperture. This means plenty of light in every shot, even after the sun has set, producing clear and vibrant photographs. To the front of the handset is another 24MP lens, ready to snap stunning selfies. Add an extra touch of glamour to your self-portraits with the Pro-Lighting feature, or employ face-recognition technology on Smart Beauty mode to intelligently highlight your best features. 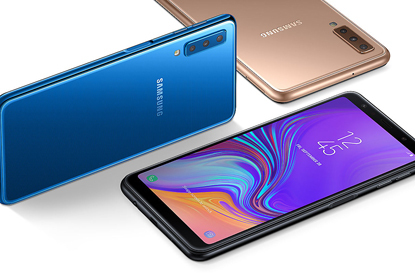 Giving you the choice of fingerprint or face recognition security, you can be sure that your sensitive data is kept safe with the Samsung Galaxy A7. If you require an extra level of security, thereâ€™s also the option to create a separate encrypted space in the form of a Secure Folder. 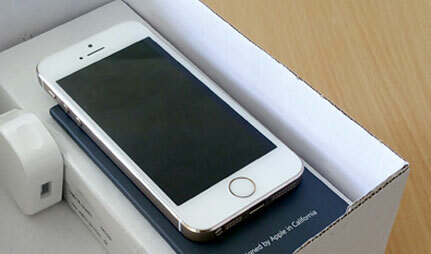 If youâ€™re worried about storing all your photos, data, and other content, then help is at hand. 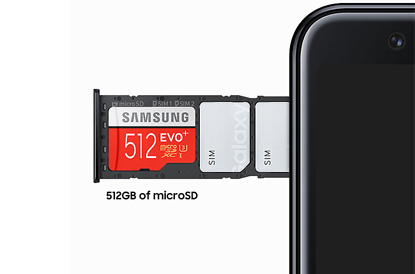 With the addition of a Micro SD slot, you can choose to expand the handsetâ€™s capacity by an extra 512GB. Finally, letâ€™s not forget Samsung Health which is also on board to manage all your activity and nutritional needs.